Rising high above Loch Arkaig and Loch Quoich, the mountains on the eastern fringes of the 'Rough Bounds of Knoydart' are rugged and wild. These majestic peaks are remote from civilisation giving a real sense of wilderness to anyone hiking here. 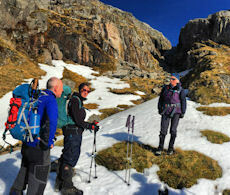 We're here for 3 days of guided hiking aiming up the high Munro summits including Sgurr na Ciche, Sgurr Mor and Gairich. Three days spent hiking into a remote area and up quiet mountains in the Western Highlands of Scotland. 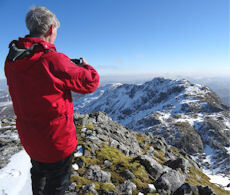 Reach superb vantage points from where vast views over Knoydart and to Skye and Kintail can be savoured. Clamber and scramble over quartzite blocks and hike along fine crests to bag 5 Munro summits (and a Corbett or two) including Sgurr na Ciche, Sgurr Mor and Gairich on the edge of the 'Rough Bounds'. Join a small group led by an experienced leader familiar with the area. 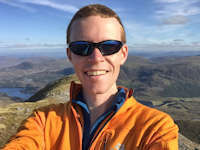 This event is 3 days of guided hiking on the Rough Bounds of Knoydart in the Western Highlands with one of our experienced and qualified leaders. Your guide will know the area well and be able to give you insight into the flora, fauna and geology. 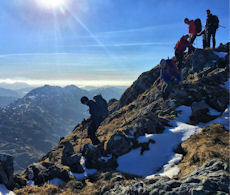 The mountains in the 'Rough Bounds of Knoydart' are wild and remote. On the eastern fringes of this area, Sgurr na Ciche rises dramatically above Loch Nevis. This mountain's silhouette is a distinctive landmark in the north-west Highlands. All of the mountains in the area require some careful planning to ascend, with many a hiker having poured over maps to find the best way to link them together. 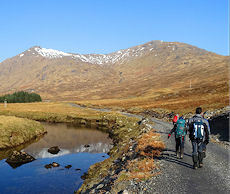 We're aiming to bag the 3 Munros north-west of Glen Dessary, starting from the western end of Loch Arkaig from where we'll begin on a fine track getting into our stride. It's a fair trek in, but soon we're heading uphill and through an interesting gorge that brings us up onto ridges. Rough Sgurr na Ciche is gained with uninterrupted views from its summit along Loch Nevis towards Eigg and Rum. Along ridges, occasionally following the remains of a wall we'll bag Garbh Chioch Mhor and Sgurr na Coireachan. We can then return directly, or perhaps take a leisurely detour on the way to ascend the Corbett Sgurr Cos na Breachd-laoidh. A hike along a fine path reaches the foot of these rugged twins ! Sgurr Mor is a big hill (as its name would suggest), surrounded by glens and other minor peaks. It stands in a commanding position above Loch Arkaig, giving fine views from its summit. Sgurr an Fhuarain is linked via a fine long and wide, grass covered ridge. As with the previous day, we'll start from the western end of Loch Arkaig and head along the fine path towards Glendessarry. Before we reach the lodge, we turn away from Glendessary and hike on a fine path northwards. 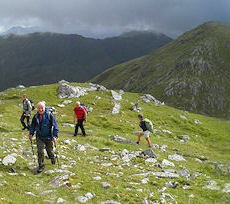 We reach the base of Sgurr Mor, where steep, grass covered slopes lead us up onto the ridges and to the summit. Sgurr an Fhuarain is a half hour detour from the col, and the return is via the route we came in on. 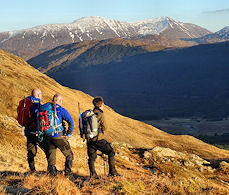 One remaining Munro above the southern shores of Loch Quoich awaits ! Gairich is a suprisingly rough hill ! It rises above the eastern end of Loch Quoich. Our final day on the Rough Bounds of Knoydart begins by the dam at the eastern end of Loch Quoich. After crossing the dam and on an old stalker's path, we'll hike over grass and rush southwards towards Glen Kingie. Uphill, views gradually open up as the rugged eastern side of Gairich comes into view. A faint path can be traced zig-zagging the way to the summit, from where views make you go 'Wow!'. The hills in this area are quite rough and a fair amount of legwork is done on pathless terrain. There is some easy scrambling on the first day. The first two days are classed as 'demanding', the third is classed as 'moderate'. Leading the event on 7-9 September'19. Spean Bridge, which is around 10 miles north of Fort William, and Invergarry which is a further 15 miles north are ideal bases to locate for this event. The first two days begin from the western end of Loch Arkaig which is at the end of an unclassified road around 10 miles west of Spean Bridge. Monday's hike starts from the unclassified road which heads from a few miles west of Invergarry and continues to Kinlochourn. There are no bus services along either of these narrow roads.